Here I am back in New England enjoying every drop of the autumn season. I am Sinking in and Settling down into my winter’s home and relishing in the comforts of it. But that is not to say that springtime back in Puglia is too far off my mind. 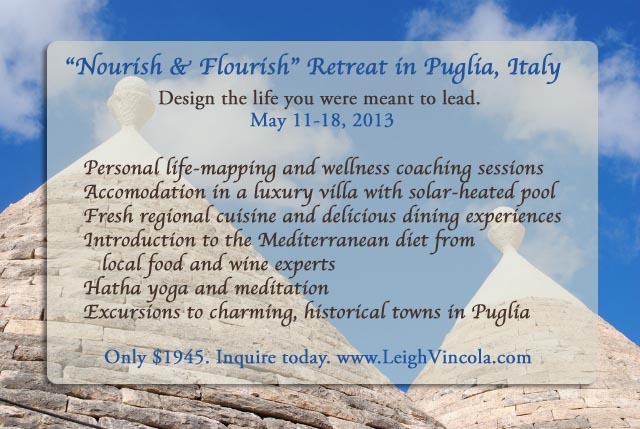 While the snow flies, I will also be preparing for my first annual Puglia retreat, Nourish + Flourish in partnership with yoga instructor and wellness coach Sara Hauber. Sara and I will lead an intimate group of 8 through daily coaching and life mapping sessions, yoga and meditation practice and culinary exploration. Our aim is to set you on the path towards designing the life you were meant to live. We will provide you with experiences that touch all the senses in truly spectacular springtime setting in Southern Italy, and send you on your way with tangible tools that help you map your way on your own. Puglia is the perfect place to check out and dig into yourself for a while. Plenty of sunshine, Mediterranean cuisine, a whole lot of you time. Lux accommodation with a solar heated pool. There is no question that you will find wellness. Please visit my retreat page where you will find the full itinerary. Below is a little snapshot of some highlights.